Today’s architectural visualization take us back to Bordeaux, France. 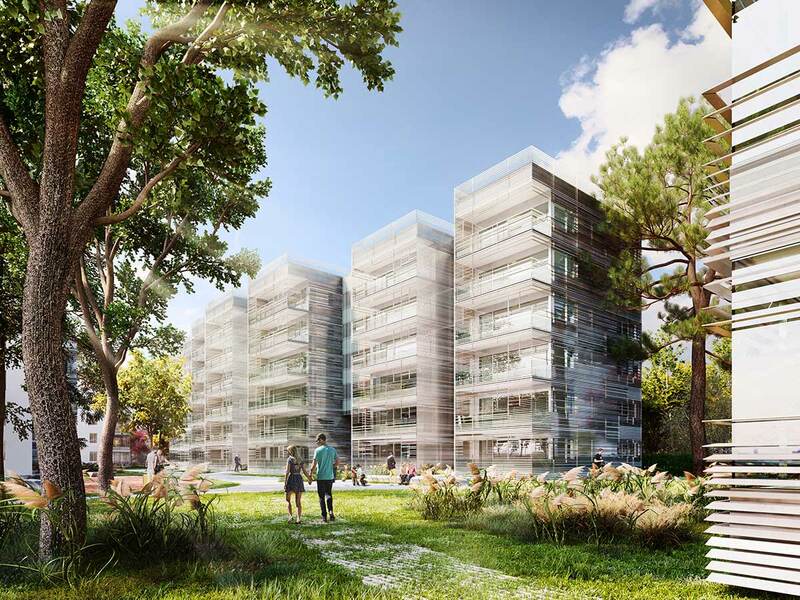 The architectural firms RCR arquitectes and Artotec are developing a new project, the residential Jean Moulin. It is a project of rehabilitation of existing housing blocks and the construction of a new building. The existing buildings stand out for its sober and serene character, compact buildings that reach G+4 storey. They are located on a garden that takes a leading role in the intervention serving as a link between the existing and the new. The intervention in the existing buildings aims to preserve the serene character of the blocks through a lattice facade which filters and gets all the space of the balconies. With the repetition of the same horizontal element, that opens, closes and turns, a unified lattice in the entire façade is achieved. The overall concept between the rehabilitation and the new building is joined by the this concept of the lattice facade. This facade of galvanized aluminum will have two different intensities within the same hue, in the rehabilitation the tone will be clearer to integrate it with the existing and in the new building the tone will be darker. The commissioned included the production of two exterior architectural visualizations that mostly focus in the new building without renouncing to also show the rehabilitation. The proposal included the landscaping project that specified all the vegetation of the garden. 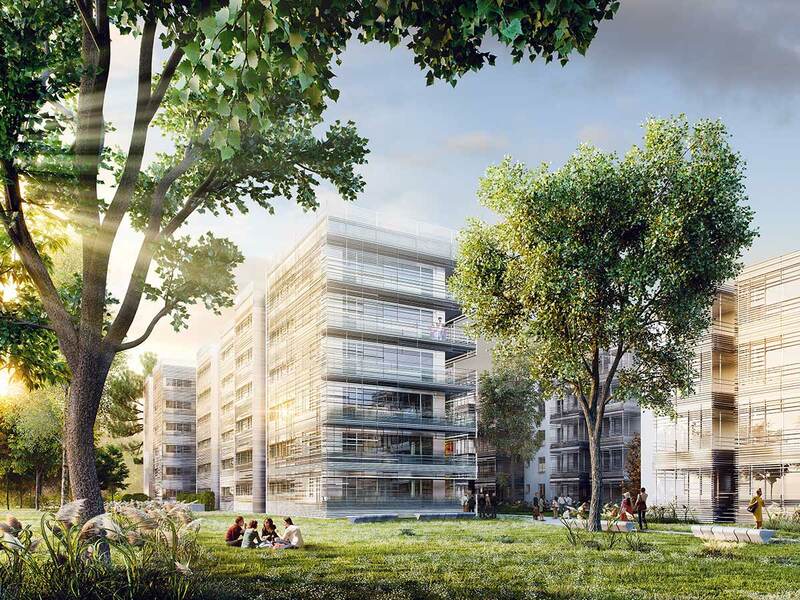 With the modeling building and placed the vegetation, several views were tested to find the architectural visualizations that better explain the new building and its relationship with the environment. One of the important aspects in these architectural visualizations was to get the atmosphere sought by the architects. To do this, we worked with reference images that embodied the main features to follow. With the architectural visualizations finished, we began the post-production phase. People were placed, we played with the intensity of the reflections, glare and the general lighting.